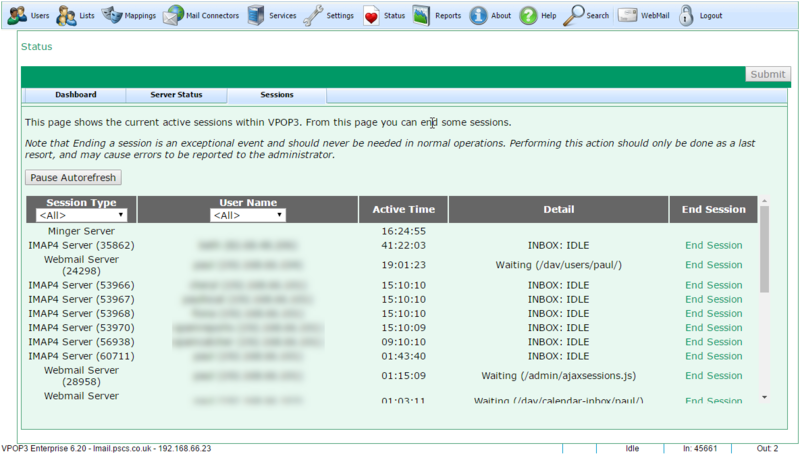 This tab shows the current active sessions in VPOP3. This can be useful for seeing how busy VPOP3 is, or if someone is accessing VPOP3 from somewhere they shouldn't be, etc. •Session Type - this shows the type of session, eg SMTP Server, IMAP4 Server etc. There may be a number in parentheses after the name, this is a session ID, and can be used to relate to diagnostic log file entries. The session IDs increment for each type of session separately, so can give an idea of how active VPOP3 has been. •Detail - this shows information which may be useful to work out what the session is currently doing. •End Session - Some sessions can be ended using the 'End Session' link. This terminates the TCP/IP connection associated with the session, and the session itself will terminate after it has noticed the resulting error, and has cleaned up, so it the session may not disappear from the list immediately. You can filter the list by selecting entries in the Session Type and/or User Name table headers. Usually the list periodically updates, but you can pause it by clicking the Pause Autorefresh button. •Waiting means that the session is currently waiting for input from the client. •IDLE in an IMAP4 session means that the session is currently in IDLE state, which is not the same as “Waiting”. IDLE means the client has asked the server for notifications if anything changes in the currently selected folder.